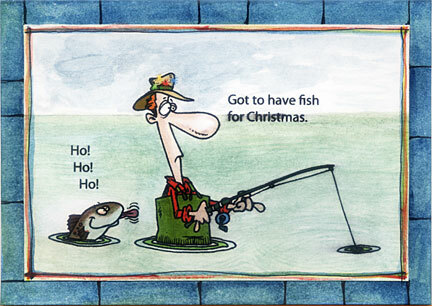 Making fishing Christmas cards for friends, colleague or family members who love to fish is a thoughtful gesture. 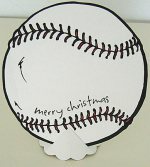 Any one of them who loves fishing would be very appreciative to receive such a handmade holiday card. It shows how much thought and care you put into making that Christmas card. My brother, Nick, loves fishing. He loves it so much that at one time, he even built a fishing website to talk to the whole world about his hobby. So this Christmas, I'm making a fishing Holiday card for him. 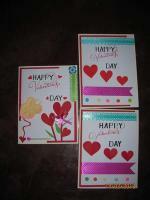 And the card above is one I created. I'm sure he'll like it. Use a graphic editing software like Photoshop to add words on the fishing clip-art. Print fishing clip-art on white card stock. Trim to size 3.5" x 5.00". Cut a A4 size white card into half and fold to make a basic card. Paint the clip-art and the frame with watercolours. 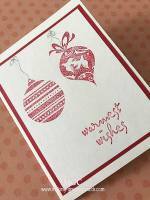 When dry, attach the white clip-art card to the front of the folded card with double-sided tape. 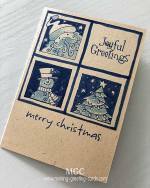 Rubber-stamp or handwrite a Christmas poem or Christmas greeting on the inside of the card. That's it! Quick and simple! Looking for the fishing clip-art took the most time. After much searching, I was able to find a suitable line graphic from one of my purchase CD collections of clip-arts. After the search, it's plain sailing. All I needed to do is open it in Adobe Photoshop and resized it to a suitable dimension to fit my card front. If you don't have Photoshop, Photoshop Elements will suffice. Here's the link to get Photoshop Elements. By the way, I'm not an affiliate but just providing a link for your convenience. You can also cut out pictures of fish and use them to make a collage cards. Fish collage cards make good fishing Christmas greeting cards too.